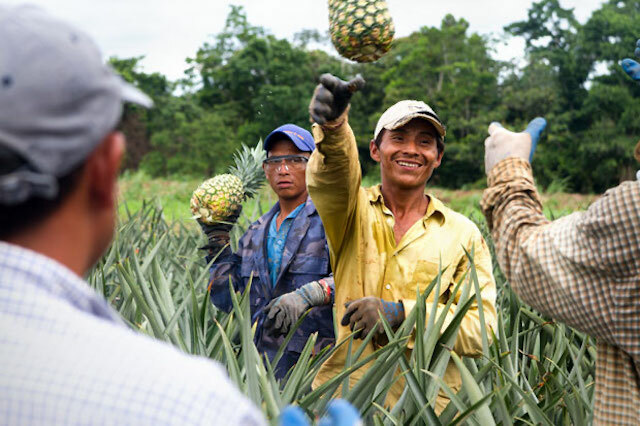 Farmers from the COOPEMET cooperative harvest pineapples near Nueva Guinea, Nicaragua. TechnoServe worked with COOPEMET and 12 other farmer organizations across Nicaragua to identify better market opportunities and improve productivity, post-harvest technologies and business practices. Through the ACORDAR program, funded by the U.S. Agency for International Development and managed by Catholic Relief Services, members of the COOPEMET cooperative were able to purchase machinery to help them sell cut and packaged pineapple at the local market. By investing in infrastructure that adds value and improves the quality of their product, these pineapple farmers are building a sustainable business and creating a more prosperous future for their families.